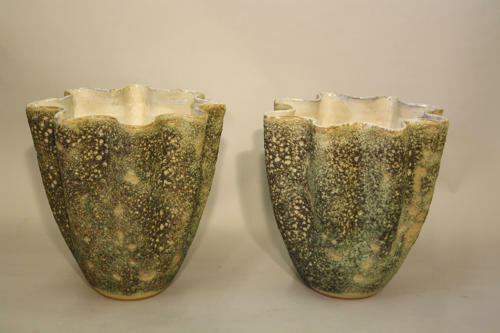 A superb hand made, coil constructed and folded terracotta vase which has been glazed and fired several times in order to achieve the beautiful textured appearance and natural green and neutral colours. A stunning organic sculpture almost like a deep sea coral. French c1970. In perfect condition. Great impressive size and wonderful to have a pair!